When i was in Boots recently, they had a 3 for 2 offer on all skincare. After recently trying out the botanics eye makeup remover and being highly impressed with it, i went back for more and thought i would try out some other things in the Botanics range. 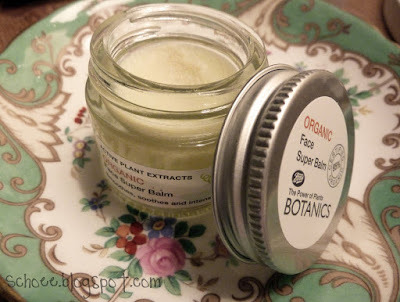 One of the things that caught my eye was this "Organic, Face Super Balm"
"This richly hydrating superbalm is blended for the use on areas that really need extra moisture. 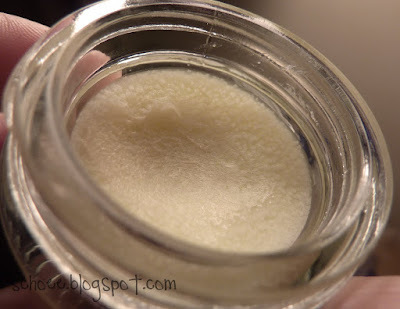 With Argan Oil to deeply moisturise and protect, plus shea butter to nourish and condition." "The Argan tree is perfectly adapted to cope with the harsh conditions of heat and the drought of its native Morocco. The oil, rich in polyunsaturates and natural Vitamin E, has been the local women's beauty secret for centuries, nourishing and protecting the skin." During the winter, i get awful dry skin..not all over, just in patches..making my skin combination, and finding it hard to keep both the oily and dry areas at bay. I have been looking for something exactly like this to rub onto the dry skin. I have already started getting winter skin, and its only september...how depressing, summer is now officially over in my books. I have been using this for the past week or so, and its become my new best friend. The pot is small enough to chuck in your handbag or makeup bag to take it with you and apply whenever needed. It's very concentrated and so you don't need much. I love the consistency of it...i always feel like lotions dont moisturise my dry skin well enough, or i have to apply it alot more regularly. When i apply a fingertip amount of this, it lasts so much longer. I'm so pleased i found this! I know it's going to be a life saver when it starts getting alot colder.